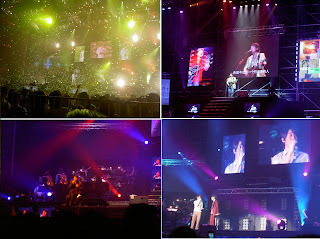 Shing's Adventures...: Emil Chow's Concert~!! 20 years...exactly my age...and itz kinda unbelievable that Emil Chow is already in the entertainment industry for 20 years!! Yeah i know...he's not my era and I shouldn't be the one watching his concert right?? But actually, I do know quite a number of his songs because he has got so many hit songs over the past 20 years... And I'm lucky enough to win 2 free tickets for it!! I met up with bros and Eileen yesterday and bro also bought 2 tickets for the concert...so 4 of us went together. The biggest mistake that we made was not driving there...instead we took the lrt and found out that it was a completely a wrong choice!! 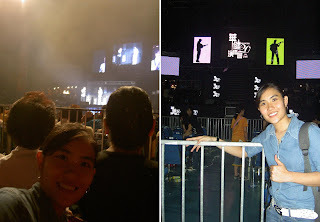 We were almost late coz we reached at 8.10pm and the concert started at 8.15pm...luckily!! This time...I was quite surprised that our seat were pretty good...we were seated at the 2nd row behind the VVIP area...and we could see him quite clearly...Awesome!! But it was kinda boring in the middle coz I didn't know those songs. But the last part was good coz he sang all those hit songs. The concert lasted for more than 4 hours and it was definitely worth it...it ended at about 12.30am with the song 'Peng You'. His guests for this concert were Nicholas Teo, Victor Wong & Li Zhi Qing. One thing that I'm quite unhappy was that bro insisted on leaving the concert in the middle to drive the car over...he was the one who wanted to watch this concert and I he really missed quite a lot. 2nd bro was the one who was supposed to go coz it's alrite for him not to watch...and moreover...we got our tickets for free. Eldest bro spend hundred over for a ticket and he missed the part where Emil sang lots of hit songs...too bad!! Guys...please don't be so egoistic...there're times that your decision might not be the best! !